So, see you in Nighthold and thanks for following the race here! A few more finishers in the last couple of days, but we can't really determine their exact positions as the timing comparisons with Chinese servers are getting harder to come by, so we'll just mention who it was that got to that 3/3! Ecology Myst, eXample and Herp Derp have all beaten Helya and are done with ToV (progress) and are on to ToV (farm)! We have a bunch more kills from yesterday, with Exorsus, Euphoria, Innominatum and SNF finishing up ToV and SNF also grabbing the last spot on that US top 5 as well. And the top 20 is done! The final two spots went to Style War and Prestige Gaming, as KeaHoarl just missed out and finished in 21st. Congrats to all the finishers! Limit are back after their 8 day break and have re-downed Helya with considerably more breathing this time. They cross the finish line as US/OC 4th and World 18th! Two kills today as Fusion get the 16 slot and EU 12th and Right land in 17th but also grab the Asia third. The 15th slot is now closed as NollTvåTre down Helya EU 10th! Only 5 more to go until the top 20 is locked down. And we have a US/OC third! 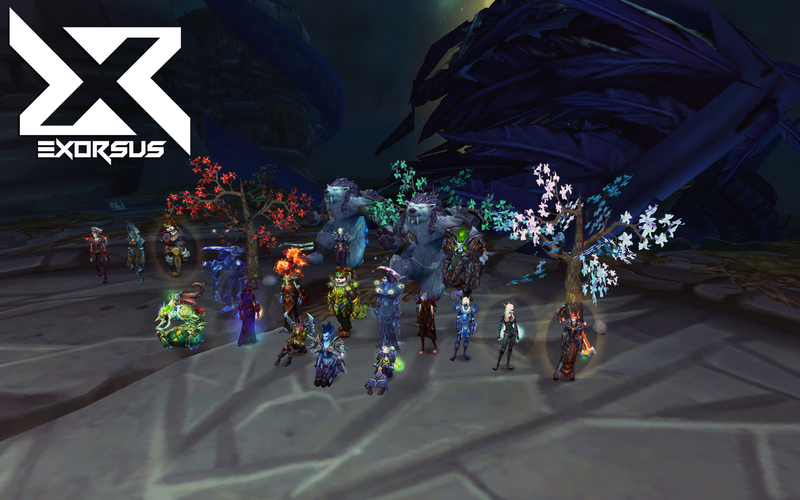 Midwinter are finally back on the tables as the down Helya and finish Trial of Valor World 14th. More kills today as both Pieces and Nova down Helya, World 12th and 13th! 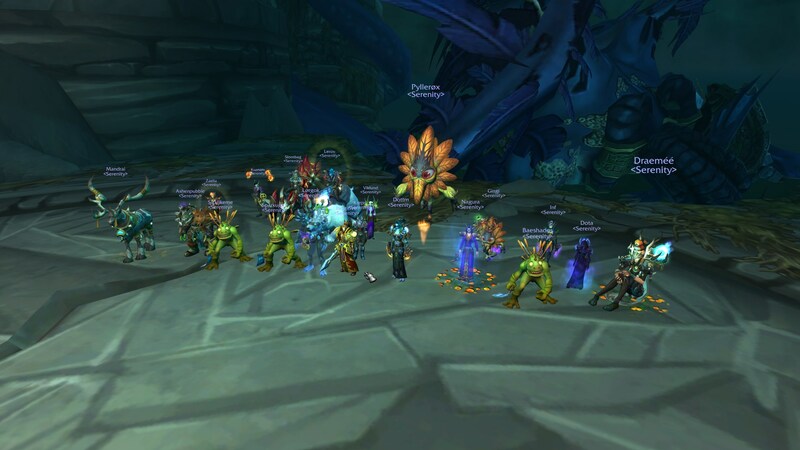 Set sail for fail are the latest to join the 3/3 all done club with their World 11th, EU 7th Helya kill. We have a top 10! 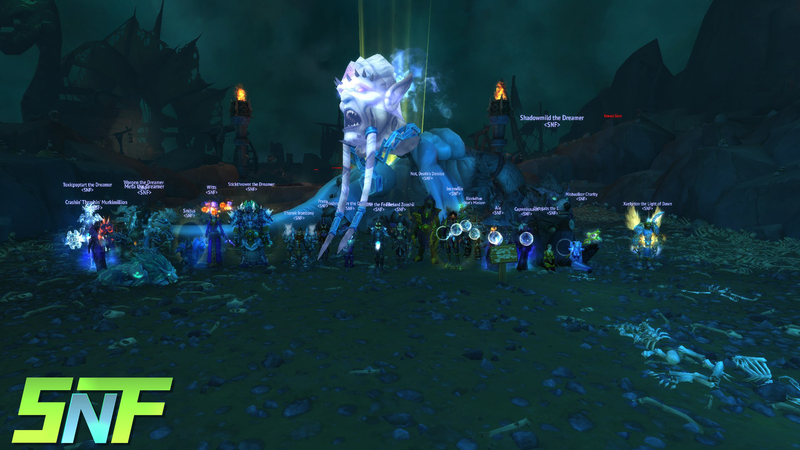 Alpha got the Asia 2nd and World 10th kill, heading to 3/3 and downing Helya, Gz! Honestly get the US/OC 2nd and World 9th, making it 2 OC guilds as the only Helya killers in that region. Congrats! And we have an Asia first! Repeating their region dominance from Emerald Nightmare, Allstar have downed Helya World 8th! Congratulations! More kills! 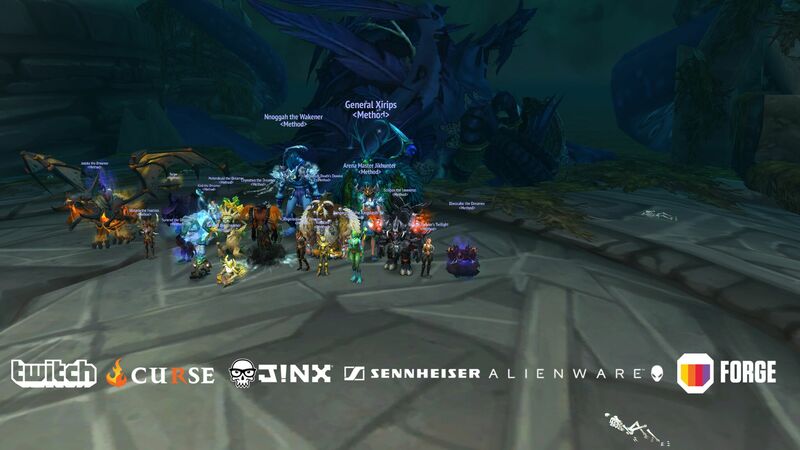 FatSharkYes join the top as they grab the World 7th, EU 6th and clear Trial of Valor. Congrats! 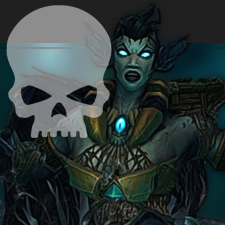 A big day it seems as we have a whopping three new Helya kills! ScrubBusters and Entropy round out the top 5 with entropy grabbing the US/OC First as well and Openness get themselves in 6th place overall and EU 5th! Congrats to all the finishers. @FromScratchWoW @danishterrace She's breathing, damaging tanks with it, spawning adds. Similar to putting p3 Cho'gall on the throne in BoT. @FromScratchWoW @danishterrace Obviously not the strat the encounter's designer intended, but no part of that is a "bug." The World third Helya video from Danish Terrace is also out! And we have a World third...again. 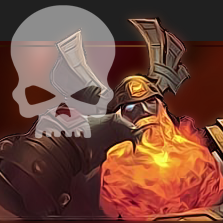 Danish Terrace are the first new guild to kill Helya after the bans and congratulations on the bronze! Still no new kills (from non Method/Serenity guilds at least) on Helya which is somewhat surprising as I was expecting at least one or two Asian guilds to get her down by now. Could it be possible for the three banned guilds to actually come back and retake their spots after their bans expire? Meanwhile the numbers on Guarm and Odyn keep going up as we have 77 guilds on 2/3 and 236 on 1/3. We had the choice between using the “bug” or wait until Blizzard hotfix the boss so that we could implement our Archimonde strategy. Having to avoid breaths to meet the DPS requirements led us to the obvious decision. The only real difference compared to Archimonde is that a single tank death was enough to avoid all the 5 breaths of the last phase (whereas 4 tank deaths were needed to avoid 4 sources of chaos on Archimonde). We killed Helya with 3 unused BRez, so we could have reproduced exactly the same strategy if the breath had not been bugged. It is clear that some of these abuses have had a far greater impact than Helya’s breath had during ToV progress. To our knowledge, the last time guilds were suspended for exploiting a boss goes back several years, on The Lich King. Top guilds haven’t stopped killing bosses by using game breaking mechanics by any means. From Scratch playing, like most of the guilds cited in our examples, above all to perform the best possible performances on each tier, it seems essential to us to use any solution at our disposal allowing us to distinguish ourselves from our opponents. If we do not do it, they will probably do it. From then on, it becomes inconceivable to tell us “do not do that, there is a risk of a suspension”, while there are many examples where Blizzard decided to tolerate this kind of behaviour. We do not seek to convince you, nor to legitimize, nor to justify this kind of behaviour, but simply to make you understand why we chose and systemically will choose to use this kind of flaw. We would be delighted to not have to make that kind of decision. We would have clearly preferred that Helya have no flaws. However, it seems obvious that it is impossible for developers to make perfect bosses. Exorsus have just released a statement on this issue, and it's a long one. The GM covers several issues, from the actual Helya exploit, to poor progress coverage on the part of Blizzard, the damaging effect of legendaries on the race, and just what ToS violations really mean for top guilds. The full thing is really worth a read, but I'll get some of the more relevant quotes here. You should particularly check out the part about Blizzard's "progress coverage" as it has a lot of truth to it. Helya has a "Breath" ability, which deals cone damage + spawns adds on 1st phase and void zones on 2nd phase, that should be soaked. Our guild found out, that if you're killing your tank on 1st phase, Breath is stopping, so using shamans talent "Ancestral Protection Totem" to kill your tank effectively gives you more damage on 1st phase without any negative consequence. At that point we never knew how it works on last phase, however we've been pretty confident that we can avoid this breath the same way on the last phase. Before starting to discuss everything else, i'm pretty sure some of you will ask - why would you do this?! It's an exploit by itself, you're killing tank to avoid mechanics. The answer is no, that was the strategy everyone been using on Archimonde (avoiding the crystal via tank death) and even Blizzard themselves are ok with this part. So the real deal comes to the last phase, because for some reason after you're avoiding first breath, she simply stops casting it. It's an obvious bug (that has been reported by some guilds on a heroic week), that makes encounter easier (not even close to trivial, if you ask me). So at this point we had 2 options - completely scrap the strategy and start inventing new one or stick to this strategy, considering it's still a solid one, because even without this bug it's a valid strategy (because if Blizzard fixed a bug, that Helya stops breath we still can kill our tanks to avoid the same ability, simply by ressing them via combat resses or via shaman's totem). I guess you already know which strategy we've chosen after all. So now comes the last part of 1st paragraph - our kill log. In case some people are wondering is this legit kill or not (or if the boss is trivial with this "exploit" or nor) - when boss died we had 3 combat ressurections available + totem (more than enough to cover all the breaths without any bug on the encounter). - Exorsus GM Alveona. I'd just like to add that the timing of these bans is actually good, as it will hopefully make it clear to all the guilds that clever use of game mechanics on this level won't be tolerated and we'll get a clean race in Nighthold, which is the top goal for all the guilds. It will also hopefully illustrate that maybe Blizz should pay a little more attention to bug reports directly from the top guilds, or that they should at the very least have a better way of communicating that the bugs won't be fixed in time but should in no way be used (although this one was pretty obvious). Some more news on the suspension front: it seems the ban was for 8 days and the bug with Helya's breath had been reported a number of days before the affected guilds got their kill. @WarcraftDevs @WatcherDev Ran into an encounter-breaking bug on Mythic Helya. 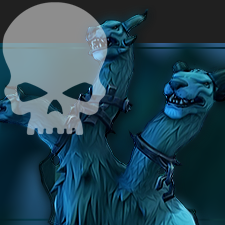 Limit have issued a statement on their own Helya kill and the exploit itself, and we have removed the three guilds from our tables. It seems all three guilds mentioned below, Exorsus, From Scratch and Limit no longer have the guild Mythic Helya achievements, so it would appear that whatever it is they did (rumor has it it's to do with Helya's breath) did indeed get them banned for a limited period of time. Well, ToV is getting to be quite an eventful mid-raid as Exorsus have been banned for something they did on their Helya kill. There are also rumors that both From Scratch and Limit players have also been banned for the same reason, but we don't have any confirmation on that yet. We also don't have the exact details but it seems all the raiders present for the kill have, in fact been banned. We're not quite sure how long the bans will last, but we'll update you when we do. It seems Method's video has caused some havoc over on the Asia servers, as the guilds there have now completely changed their strategies and are trying to emulate the strat found in the video, which will delay them more since they need to re-adjust their raid comps and learn how to do the individual phases with the new comps. And here it is, Method's World First Helya Mythic kill video! Limit are the first US guild to down Helya. World 5th kill which finalizes our top 5 as follows: 1. Method, 2. Serenity, 3. Exorsus, 4. From Scratch, 5. Limit. From Scratch get the World 4th kill on Helya! Very impressive after their earlier troubles with missing raiders, it seems they managed to pull through and get the same spot they had in Emerald Nightmare. Congratulations! It took them 347 pulls to down the final ToV boss. And here's the final few seconds of Helya's unkilled life, courtesy of Forge and Sco: http://forge.gg/i/VmlkZW86ODcxNjAw. The top 3 is complete! A replica of the Emerald Nightmare one, with some serious reshuffling, as Exorsus grab the World third on Helya and 3/3! Here comes No.2! Serenity have downed Helya, gone 3/3 and finished off Trial of Valor, adding even more hype for Nighthold as the No.1 from Emerald Nightmare still isn't done. And we have the pull count for Method on Helya, but before we get to that I'd like us to remember that the pull count on Xavius was 19 and Cenarius was 66 for those respective World Firsts. The pull count for the World First on Helya was 224. So aside from saying gj to Method again I'd also like to say GJ to the Blizzard boss design team for reminding us they can still make a decent boss that isn't just impossible before nerfs. Thanks! While Method are taking a deserved break (or, more realistically, going straight to streaming), we've had another couple of Guarm kills on the Asia side of things with Right and KeaHoarl grabbing the Asia 2nd and 3rd on the boss. Strawberry Puppy Kisses and DNO Gaming also got to 2/3 and are off to Helya. Well, well. Helya is down with Method pulling an amazing performance, grabbing that World First and giving her a proper send-off! This is a great reminder that, come Nighthold, the competition will be extremely close, and I honestly think it'll be one of the greatest progress races ever. 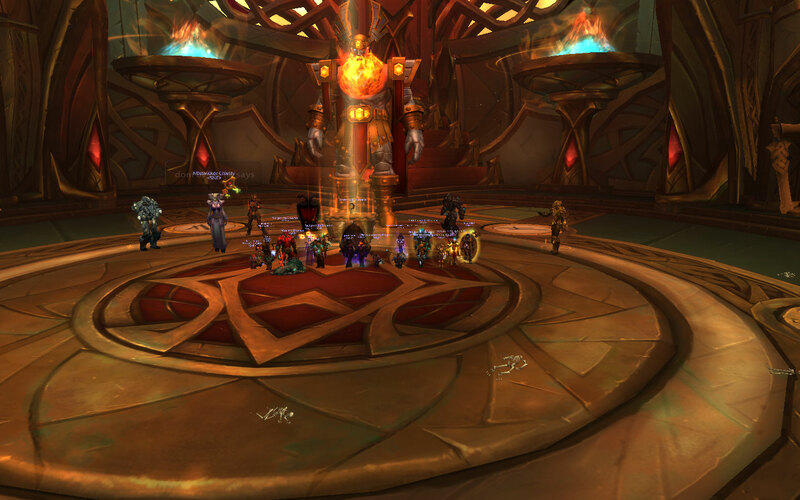 But enough about the future, huge congrats to Method for finishing off Trial of Valor, now let's see how long it takes the others to finish up and get to that 3/3! And we now have 20 guilds on Helya! Nova, FatSharkYes and NollTvåTre all got Guarm down and are in the very top group with 2/3 bosses down. Two more Guarm killers an Helya attempters have arisen, set sail for fail and ScrubBusters hop on the 2/3 train! Here we are, we now have guilds from all 3 regions on Helya! Allstar get another Asia first by downing Guarm, going up to 2/3 and facing Helya! And now for some in-house promotion, here's Method's Odyn Mythic video! It seems From Scratch are back and moving past their earlier setback. They decided to keep going, despite having less players available, and will be spending a little less time on Helya as a result. But they're still in the race, so welcome back! And the Asia top 5 on Odyn is complete as Alpha down the first boss. Trial of Valor is looking better and better! During the night (well, my night anyway) we had two more US/EU guilds climb aboard the Guarm train with Midwinter and Fusion, but in bigger news we also had some kills from the Asia server! 4 guilds downed Odyn, with the Asia first going to Chinese guild Allstar, followed by Korean guild Right and two more CN guilds KeaHoarl and Style War. No Guarm kills as of yet, but the way Helya is resisting death we might actually have a 3 region fight on our hands soon! Once again huge thanks to @andyice_77 for keeping us up to date on the Chinese side of progress! One more update before sleep, Easy make it 12 as they down Guarm US/OC 5th. Here's hoping the tentacled lady is still alive when i wake up! Hooray! Helya has officially stayed alive long enough for all three server groups to come online at least! Asia servers are up and a few guilds are already progressing, so our next goal is to see if we can have guilds from all servers actually progressing on Helya at the same time for an amount of time before she dies. Boy, Emerald Nightmare really did a number on my expectations since I'm so pleased that a raid endboss has survived through day 2. But so far Trial of Valor is shaping up to be better than expected, so yay! And we now also have the Odyn World First video by SNF (multi-pov)! Danish Terrace also managed to get to Helya, making it 11 guilds at 2/3. It seems we have one less competitor in the race as From Scratch had a substantial number of players affected by the ban wave that just went out over the repeatable Artifact Power world quest, around 10 players got between 1 day and 1 week long bans so despite them making it to phase 3 of Helya, it seems unlikely they'll be able to catch up if they even decide to keep trying when the bans are lifted. Race is over for us. P3 was fun tho. Thanks for watching. Time for a little bit of fun. It seems before the raid opened yesterday Limit and SNF were just hanging around the entrance and due to cross-server magic they ended up in a battle to the death for...well nothing really, but they still went at it and luckily someone recorded it! Another entry in the 33.33%(repeating, of course) to go crowd, Pieces grab the 10th spot on Guarm and are on to Helya. Not to be outdone by his own death videos, Guarm has fallen again! 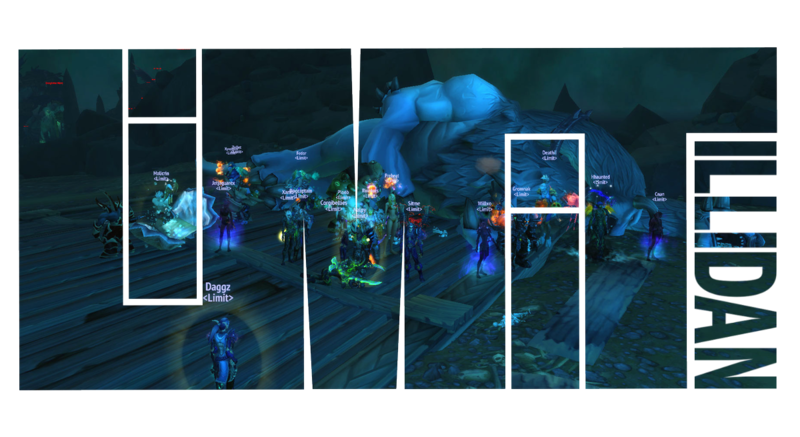 Openness have claimed the 9th kill on the second ToV boss and are on to Helya. It's been very calm since the last guild downed Guarm 5 hours ago, almost TOO calm! It's still only 8 guilds with 2/3 and on Helya, but the 1/3 crowd has grown to 19, with the most recent Odyn killers being FatSharkYes and Fusion. Ok, so this whole update was about getting to write FatSharkYes again, sue me. So here we are on day 2 and Helya yet lives! We now have 8 guilds on her, with From Scratch being the most recent addition to the Guarm down list. Let's hope she manages to live through yet another day and the Asian guilds also get involved! 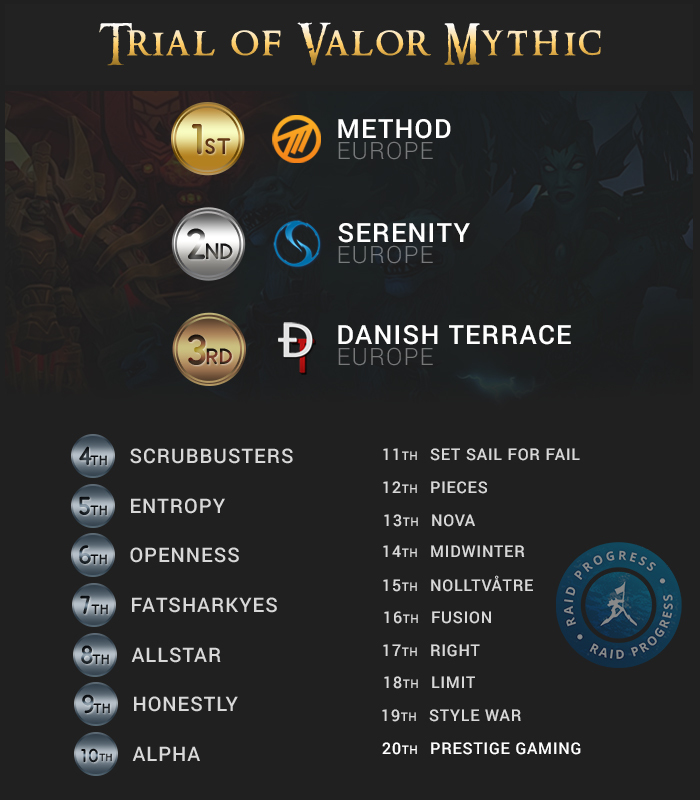 The top 3 EU Guarm: Serenity, Exorsus and Method. The top 5 EU Odyn kill-table is complete. In order: Serenity, Exorsus, Method, Danish Terrace and From Scratch. We finally see some action again as Honestly also get passed Odyn to get to 1/3 and Guarm, making it 2 guilds with two down and 5 with 1. 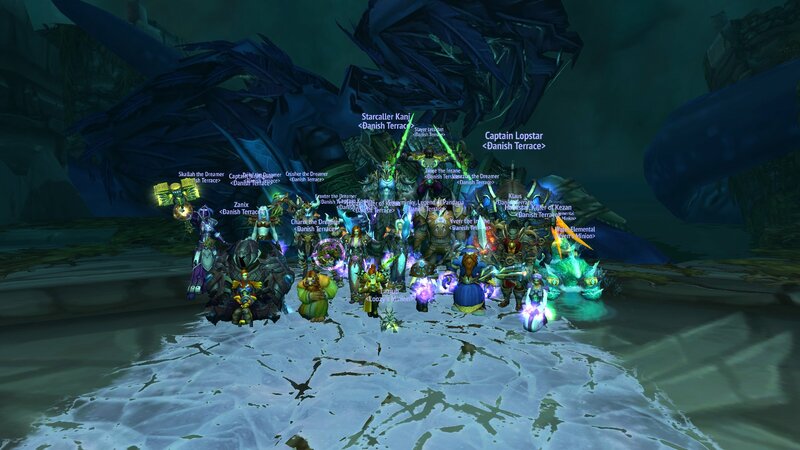 SNF catch up to Limit with their World second Guarm kill and are now also on the final boss of the raid! More 1/3s with Entropy getting a kill and making it 6 guilds past at least Odyn. Well, that didn't take quite as long as hoped, Guarm has been downed by Limit! Only Helya left so let's hope for difficulty and no bugs on her! And the top 5 on Odyn is complete, with Midwinter catching up and getting the first third of ToV out of the way. Guarm still lives and continues to give us hope. Well, Guarm has been alive for a couple of hours already so he's got Xavius beat at least. With four guilds at him and still no kill, is this the ray of hope we need to be able to imagine Helya actually being a worthy endboss? We have another Odyn slayer, Unity, but under some pretty weird circumstances as the boss bugged out and didn't use any/most mechanics. 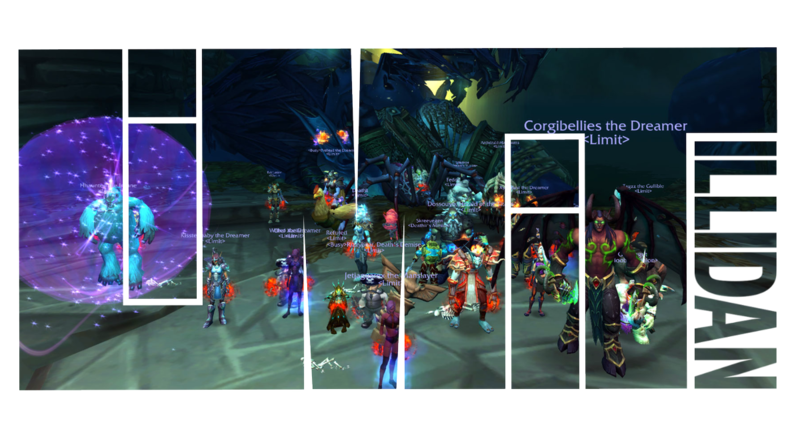 Limit went in to the raid a little later and have now downed Odyn as well, with Easy joining them very quickly after that, making it three guilds on 1/3! And we have our first Mythic casualty! Odyn is down courtesy of SNF! 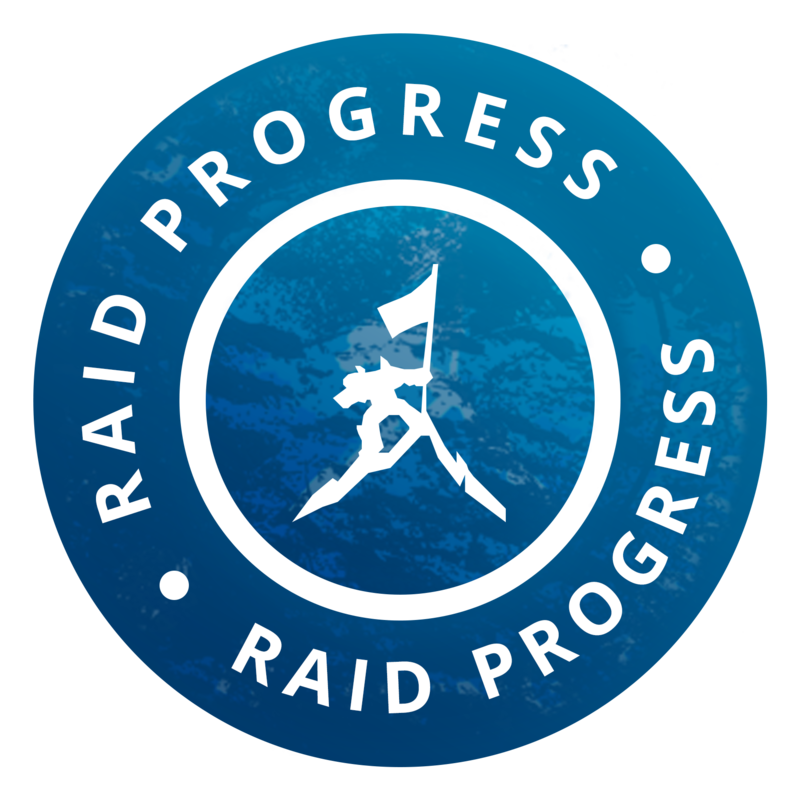 One third of the raid has been removed, and our prayers lie with Helya. It's Mythic day for the second raid of Legion, as US/OC servers are up and we'll see if this particular raid will last beyond the first day. If Helya manages to escape Limit and Midwinter's clutches on this Tuesday we might see an actual race begin tomorrow, and if she makes it through Wednesday she'll officially be the toughest boss in Legion so far. So, in a way, this is actually more exciting than Emerald Nightmare progress...right? Well, Trial of Valor might be a smaller raid and potentially a REALLY short Mythic progress, but we can hope Blizzard took the Xavius lesson to heart and tuned Helya to the item level of the top guilds, so that she may live longer than 7 hours. The top guilds made it clear that their main priority is in Nighthold, but if they see Helya still living after EU servers come online they will get interested really fast! So we may see a proper race here yet, all we can do is hope the tuning is aimed at the top guilds and all of their legendaries (that will now be item level 910). As this raid is much smaller than usual and might last a very short time, we're going to be covering it here in this article instead of on our usualy progress page, which we're keeping warm for Nighthold!